This publication is in copyright. Subject to statutory exception and to the provisions of relevant collective licensing agreements,no reproduction of any part may take place without the writtenpermission of Cambridge University Press. 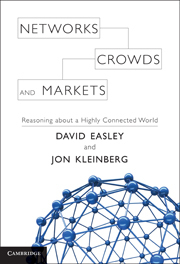 Networks, crowds, and markets : reasoning about a highly connected world / David Easley, Jon Kleinberg. 1. Telecommunication – Social aspects. 2. Information society. I. Kleinberg, Jon.